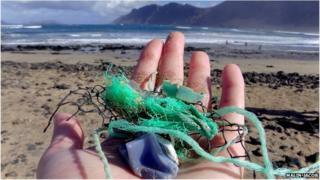 About eight million tonnes of plastic waste find their way into the world's oceans each year, say scientists. The new study is said to be the best effort yet to quantify just how much of this debris is being dumped, blown or simply washed out to sea. Eight million tonnes is like covering an area 34 times the size of New York's Manhattan Island to ankle depth. The details were released at the annual meeting of the American Association for the Advancement of Science (AAAS). Dr Jenna Jambeck, the study’s lead author from the University of Georgia, had another way to try to visualise the scale of the problem. “The quantity entering the ocean is equal to about five plastic grocery bags full of plastic for every foot of coastline in the world,” she told BBC News. Researchers have for some time now reported on the mass of plastic caught up in ocean currents, just going round and round. What is slightly shocking about this new study, also published in Science Magazine, is that it helps quantify all the plastic in our oceans - not just the material seen floating on the sea surface or sitting on beaches. The newly published estimate is 20 to 2,000 times greater than the reported mass of plastic trapped in high concentration in ocean gyres. It is clear now that large quantities of debris must be hidden on the seafloor or have been weathered into tiny fragments that are just not apparent to casual surveys. The latter are being ingested by marine animals with unknown consequences. In doing its analysis, the team pulled together international data on population, waste generation and management (and mismanagement). The group then modelled scenarios for the likely sums of plastic getting into the ocean environment. For 2010, the estimated range runs from 4.8 to 12.7 million tonnes. Eight million tonnes is the mid-scenario. It is a few percent of the total plastic waste generated that year. Media captionKara Lavender Law: "It's astounding what you can pull out of the ocean"
That lower bound of 4.8 is roughly equal to the size of the global tuna fishery. "In effect we're taking out the tuna and we're putting in plastic," commented co-author Kara Lavender Law from the Sea Education Association at Woods Hole. Eight million tonnes is the mid-scenario, though. It is a few percent of the total plastic waste generated each year. The scientists have compiled a list of the nations they find to be responsible for most of this wayward plastic. These top 20 countries account for 83% of all mismanaged material available to enter the ocean. Media captionRoland Geyer: "As a material, plastic becomes a waste product very quickly"
China is at the top, producing more than a million tonnes of marine debris on its own. But the team cautions against making simple judgements because this position is a result in the main of the Asian nation’s immense population, a large fraction of which lives along an extensive coastline. Likewise, the United States, makes an entry at 20th on the list. It too has large coastal communities. It also has much better waste management practices. But what pulls its performance down is the sheer volume of waste produced by each individual citizen – and some of this inevitably finds its way into the ocean. (The EU is considered as a bloc but would appear 18th in the list if treated as a single nation). The team says various solutions are required. Rich nations need to reduce their consumption of single-use, disposable plastic items, like shopping bags; and developing nations must improve their waste management practices. It is evident from the list that a relatively small number of middle-income, rapidly developing countries are having acute difficulties. Dr Jambeck commented: “Economic growth is coupled with waste generation. Now, economic growth is a positive, but what you often see in developing countries is that waste management infrastructure is put to one side. And rightly so to some extent; they are looking more closely at getting clean drinking water and improving sanitation. "But from a waste perspective, I don't want them to forget about this management issue because if they do, the problems are only going to get worse." The study suggests that, left unchecked, 17.5 million tonnes a year could be entering the oceans by 2025. Cumulatively, that is 155 million tonnes between now and then. And with global "peak waste" unlikely to be reached before 2100, according to World Bank calculations, the situation becomes ever more pressing. Co-author Roland Geyer, from the University of California at Santa Barbara, said it was not feasible to clean the oceans of plastic; "turning off the tap" was the only solution," he told BBC News. "How could you even collect plastics from the ocean floor given that the average depth is 14,000ft? We need to prevent plastics entering the oceans in the first place. Lack of formal waste management systems causes high plastic waste inputs into the ocean. So, helping every country to develop a sound solid waste management infrastructure is a top priority."